"Holiday Craft Fair located at Turning Pointe Dance Studio. Handmade crafts and gifts. Hot Chocolate and Baked Goods. Door prizes every half hour. Get an early start on your holiday shopping at Turning Pointe Dance Studio! " Booths will fit a 6' table (which vendors will need to supply) and are $35 per table. There are four spaces that can have access to an outlet. Please request this on the application. First come, first served. Applications are available here and are due by November 1st, 2015 November 8th, 2015. For more information, visit their website or contact their event coordinator at info@turningpointetx.com / Amy at 972.539.7017. "Arts Council Northeast presents Taste of Northeast, an annual charity event, with proceeds benefiting Arts Council Northeast and its community arts programs. Parking is free. Bring your appetite and your holiday shopping list! In addition to food from area restaurants, there will be gift vendors, live entertainment, a raffle for a $500 Visa card to help with your holiday shopping, wine pull, and a silent auction. The delicious “tastes” will be provided by 25 area restaurants, including returning favorites as well as new participants. You’ll sample a wide variety of food from many types of cuisine, along with several types of drink to try. Taste of Northeast offers a great opportunity to shop for the holidays. 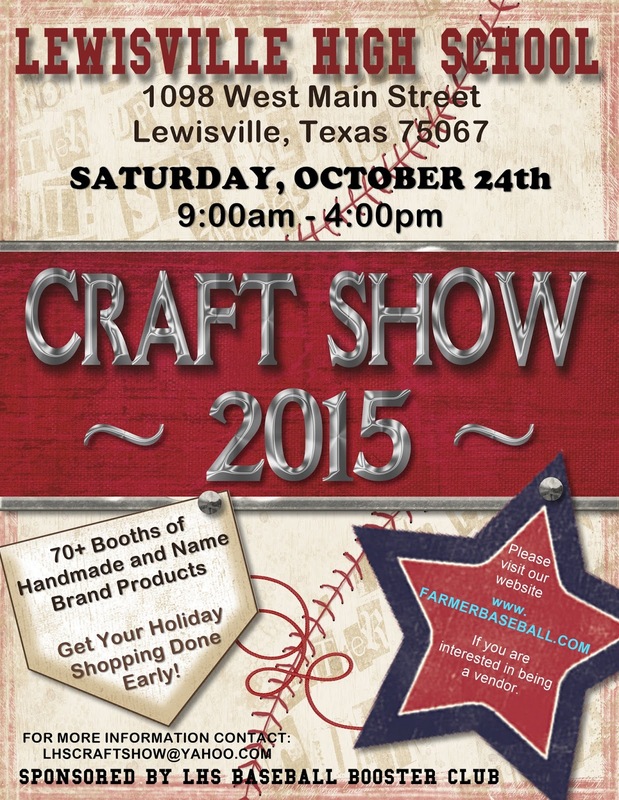 Our many vendors will be offering specialty gift items that are sure to delight. We’ll offer you beautiful and unique jewelry, art, and clothing, along with gift certificates for pampering your favorite people. Shop while eating, drinking, and enjoying live music! Tickets may be ordered online at www.tasteofnortheast.com. Tickets are $25 in advance or $30 at the door. Arts Council Northeast members and Press Pass holders get a $5 discount off advance tickets. (Discounts cannot be combined.)" This fee includes 1 skirted table (add'l smaller table available) and 2 vendor passes to event. Booths are 10 X 10 and cost $50. You can obtain more than one slot. This fee includes continental breakfast, wifi access, and beverages. Applications are available here and are due by December 7th, 2015. 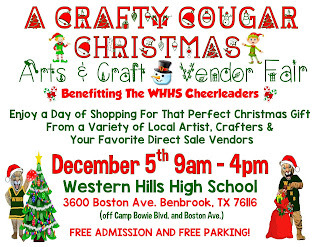 For more information, contact their event coordinator at bdhscraftfair@gmail.com. Booths are 10 X 10 and cost $60. $10 extra for electric. Vendor must supply their own 50'(minimum) 3 prong extension cord. Chairs will be available on a first come first served basis (limit 2 per booth). 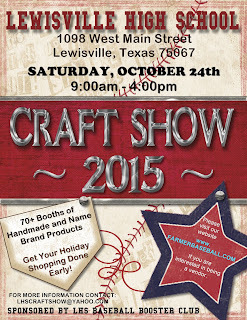 *Mention DFW Craft shows on your application for a $10 discount on booth fees. Applications are available here (and Rules and Regulations) and are due by November 21, 2015 December 3rd, 2015. 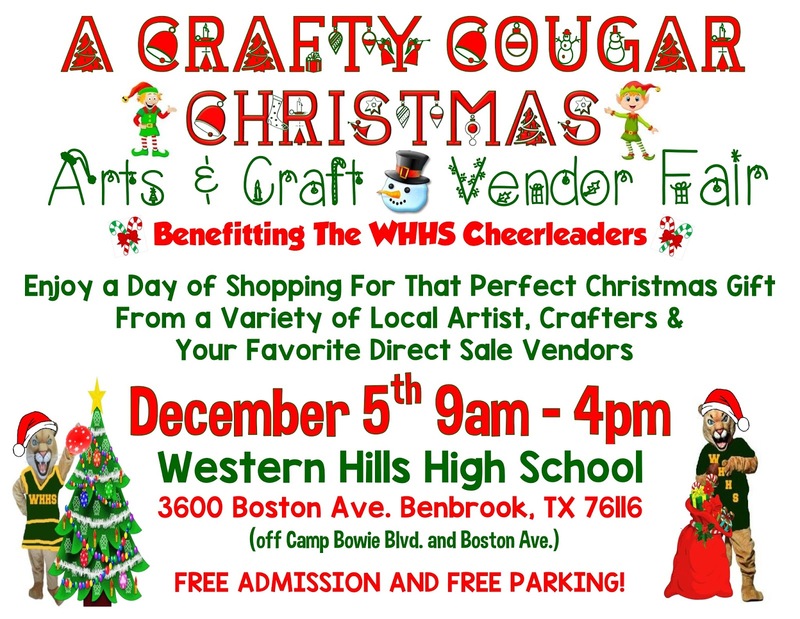 For more information, visit their website or contact their event coordinator at bhshoneycombholidaymarket2013@gmail.com / Connie at 817-223-4813 (call/text) with additional questions. "Our Fall Community Garage Sale will host over 85 spaces with sellers that included community members selling household goods, along with Independent Consultants and Crafters... Start your Christmas shopping in advance and take advantage of this one stop shopping opportunity!" In the corner with East Bethany Dr. Applications are available here and are due by November 5th 2015. For more information, contact their event coordinator at kdsummerlin7@att.net / Karolyn (469)422-5161. 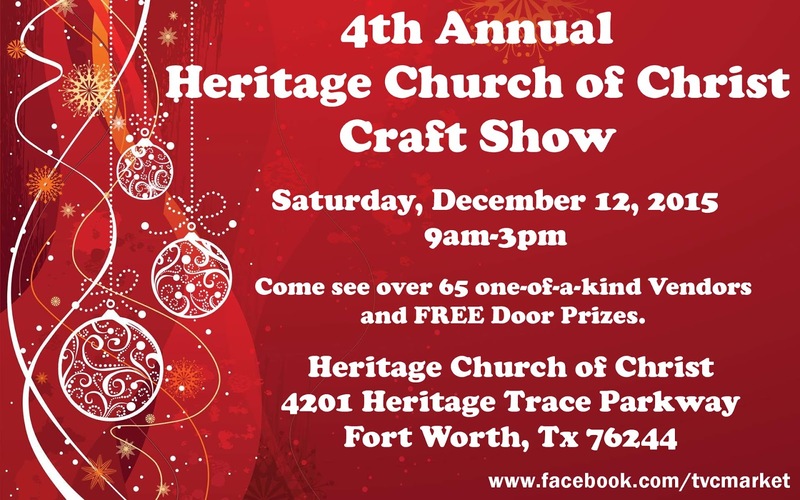 "On Saturday, November 7, we are having an arts and crafts show featuring holiday crafts, jewelry, lighted wine bottle creations, crochet items, scarves, Christmas ornaments, hand made soaps, and more galore. Refreshments will be available for a donation to our youth group. Hours are from 9:00 to 3:30. " Located on Matlock Road between Sublett and Green Oaks. For more information, contact their event coordinator at rozkeegan@tx.rr.com / Roz at 817-375-9099. Booth fees are $30 and include a booth space for you in the Vendor Area, your company name printed on race participant t-shirts and vendor area signage. Electricity Available. Applications are available here and are due by November 18, 2015. For more information, visit their website or contact their event coordinator at jonathanandtiffany@verizon.net. For more information, contact their event coordinator at info.tvcm@gmail.com / Amber at 713-360-8872. Applications are available here and are due by November 21, 2015. For more information, visit their website or contact their event coordinator at woodrowfundraising@gmail.com / Stacy at (940) 453-8753. "Calling Vendors Now! Fall Health Show and Craft Fair at Community Care Pharmacy. Give Blood, Flu Shots, Humane Society, Jump House, Face Painting and crafts galore! Proceeds for the rented spaces will go to RSVP Denton County “Rockin’ Readers” Program providing books for 1st grade and kindergartners in LISD Title 1 schools; and, Redeemed Ministries, helping to support resources to stop human trafficking in our metroplex while bringing powerful awareness to our community." Booth Space is 10x10, at $40.00 each. All Booth space proceeds go to our charties. Must bring your own tables and chairs. Limited electricity, 1st come, 1st serve. Lots of samples and hot chocolate! Parking is free. Applications are available here (health) and here (craft) and are due by October 30th, 2015. For more information, contact their event coordinator at danddg01@gmail.com / Pat - 214-738-7982. Electricity is limited, but available for an additional fee. One table and one chair are included. Applications are available here and are due by December 9th, 2015. For more information, visit their website or contact their event coordinator at jalvear@cityofallen.org / Jon at 214.509.4754. Applications are available here (along with their vendor letter and booth map) and are due by November 27, 2015. For more information, contact their event coordinator at elkstruttersvendorfair@yahoo.com / Sandra 817-658-7500. This fee includes: a 8 ft table in our fellowship hall, 2 chairs, no electricity, 1 box lunch, tea and coffee. Additional box lunches available for $5 ea. Applications are available here and are due by November 05, 2015. For more information, or contact their event coordinator at amihavics@yahoo.com. 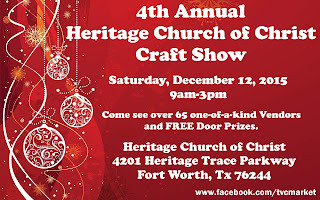 "Arts and Craft Fair in Princeton, TX at the Cowboy Church of Collin County." bring your own table, chairs will be provided. Applications are available here and are due by October 10, 2015. 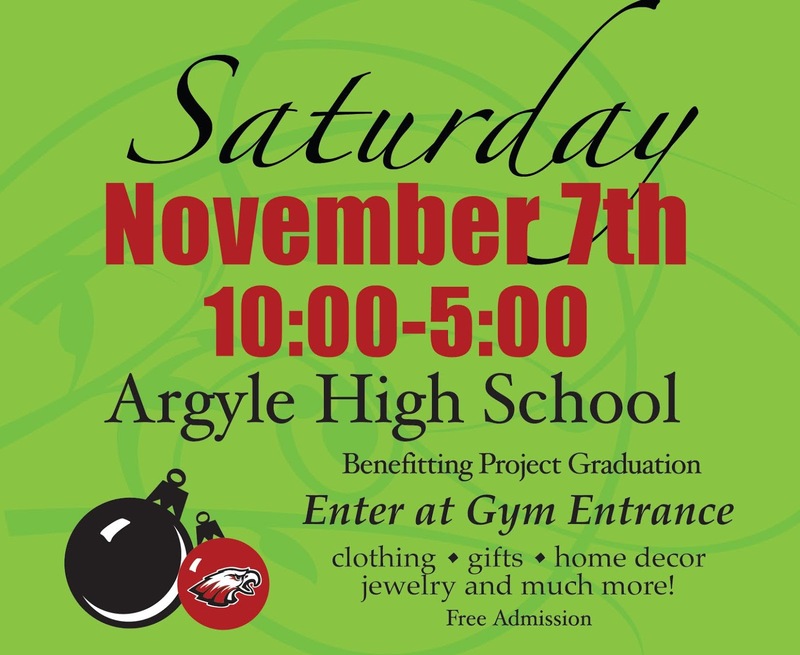 "Event that includes Vendors, Crafters, Student-Made Items, and a Bake Sale." For more information, contact their event coordinator at info@greenoaksschool.org / 817-861-5000. 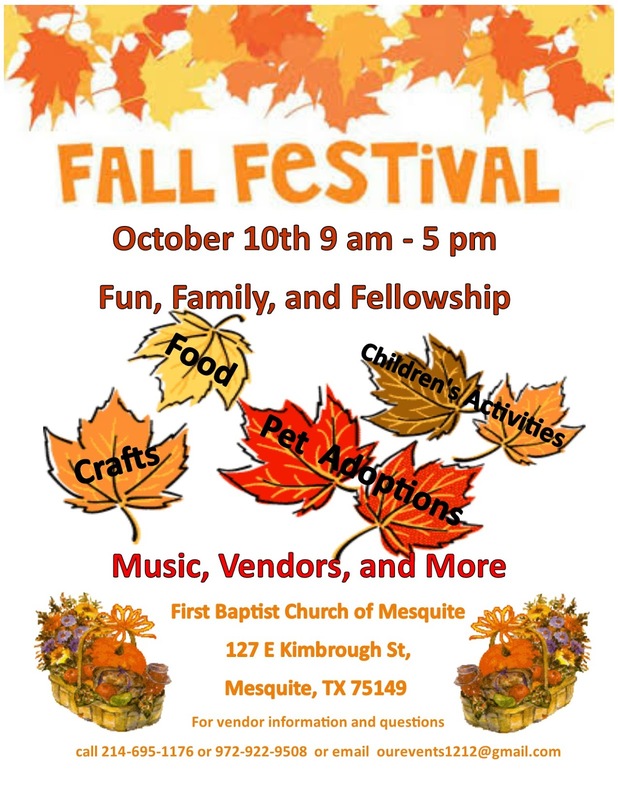 "First Baptist Church of Mesquite is hosting an outdoor Fall Festival. October 10th 9 am to 5 pm. This is a community involvement Festival of good community will and fellowship. There will be fun children's activities, music, storytellers, crafters, and vendors. Fun for all ages. Come out and join the fun." "Start your holiday shopping in October! The St. Elizabeth Ann Seton Women’s Club Holiday Craft Bazaar will take place on Friday, October 9th and Saturday, October 10th. We have expanded again with more space and vendors. The bazaar will take place again this year in our Faith Formation Center with over 80 vendors of handmade crafts. The very popular raffle table will be back along with our Seton Café for food and drink purchases. This is the club’s only fundraiser. Proceeds from the event allow the organization to respond to the needs of the parish and our community. We hope to see you on October 9th and October 10th!" 3100 W. Spring Creek Pkwy. 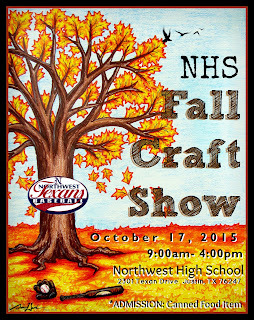 "Haltom High School PTSA Annual Fall Craft Fair -- Selling your work at a good Craft Fair is awesome, all you have to do is show up!" Applications are available here (along with vendor info) and are due by November 07, 2015. "The Springdale Baptist Church Focus Student Ministry is gearing up for the holiday seasons with a Craft Bazaar. If you are looking for unique gifts, crafts, home décor, and more, come join us. " For more information, contact their event coordinator at dannys@springdalebc.com. "Indoor event Inside Timberview's Gym. Free Entry to the public & Free Kid Activities." Booths are 10 X 10 and cost $65. For more information, contact their event coordinator at tnt2agent@yahoo.com / Teresa at 817-371-1708 or 682-314-1525.